The Oasis P12FPM Water Cooler shall deliver 11.7 gph of 50°F water at 90°F ambient and 80°F inlet water. Model P12FPM has a push button on the front of the cabinet. Water flows as long as the button is depressed. Cabinet finish shall be brushed stainless steel. Cooling system shall use R-134a refrigerant. Shall comply with ANSI A117.1. Shall be listed by Underwriter's Laboratories to U.S. and Canadian standards and conform to European Union Directives. 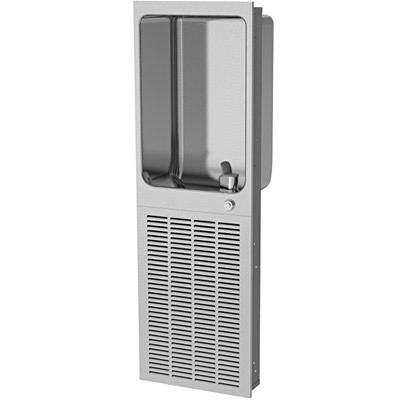 These Water Coolers are certified to be lead-free as defined by the Safe Drinking Water Act. Oasis Water Coolers are manufactured with a waterway system utilizing completely lead-free materials. These waterways have no lead because all lead materials, such as leaded brass, have been removed. All joints are brazed using silver solder only. No lead solder is permitted. Welded, Heavy-Gauge Steel Wall Mounting Sleeve. High-Efficiency Cooling Tank and Coil.